← The Chef’s Table Exclusive Blogger Event at Canyon Creek! 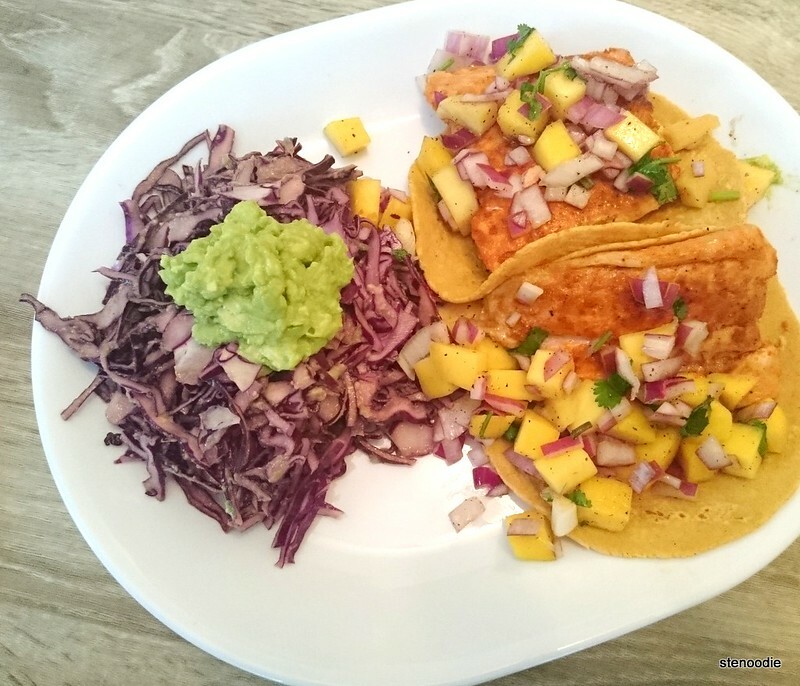 Salmon Tacos with Mango Salsa and an Avocado and Purple Cabbage Slaw: what a long recipe title! XD This is now my 6th plate from Chef’s Plate! 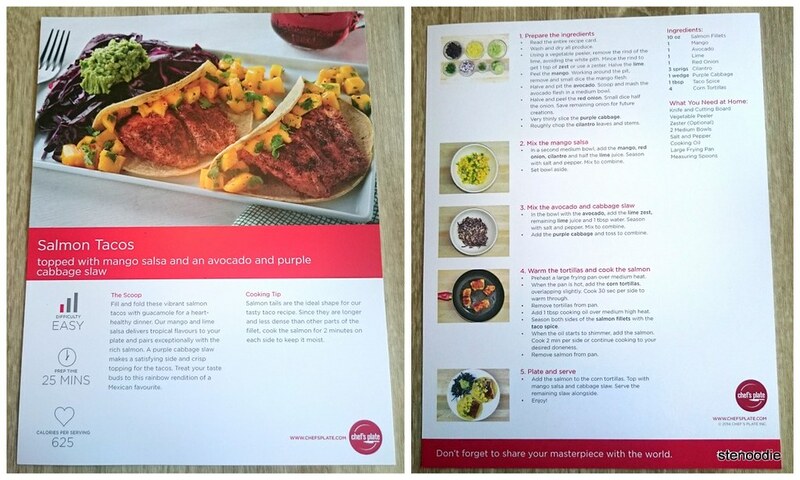 I have been falling in love with this home delivery service with every dish that I make from them. 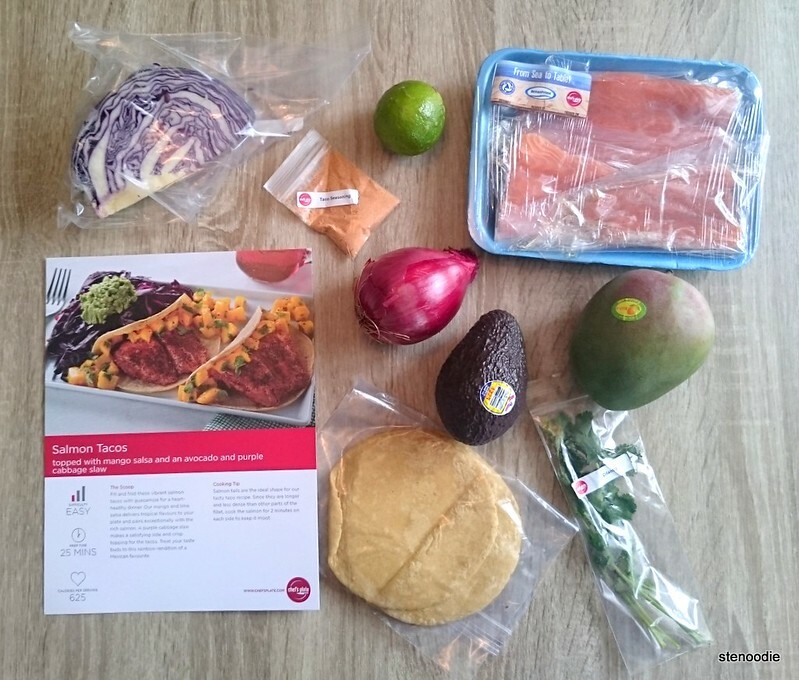 The reason being that it is so easy and straight-forward to follow the step-by-step recipe and use the pre-portioned ingredients to make a meal at home. I don’t need to think about what to make, what to buy, or how to make it. Everything is already all laid out in what I receive in the delivery box. Here’s to plate #6! This one had a difficulty level of Easy and slated prep time of difficulty level of Easy and slated prep time of 25 minutes. This was definitely true as this plate was so much easier to make than the previous ones. The steps to making this were simple enough: wash and dry all fruit and veggies. 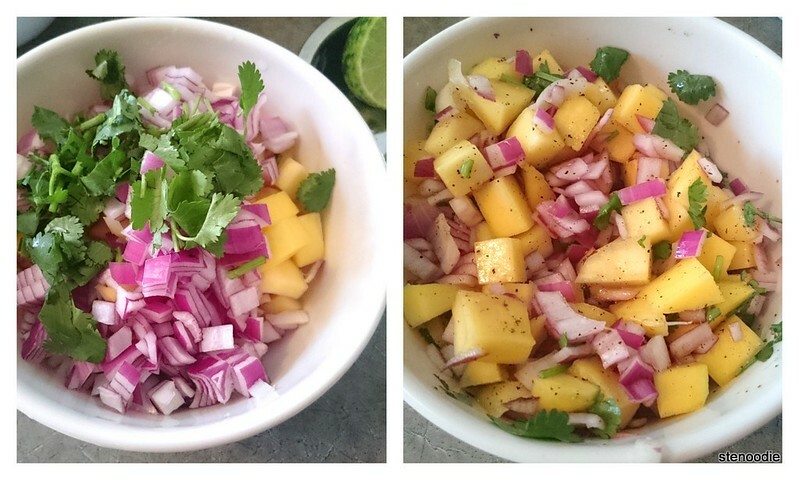 Make the mango salsa. 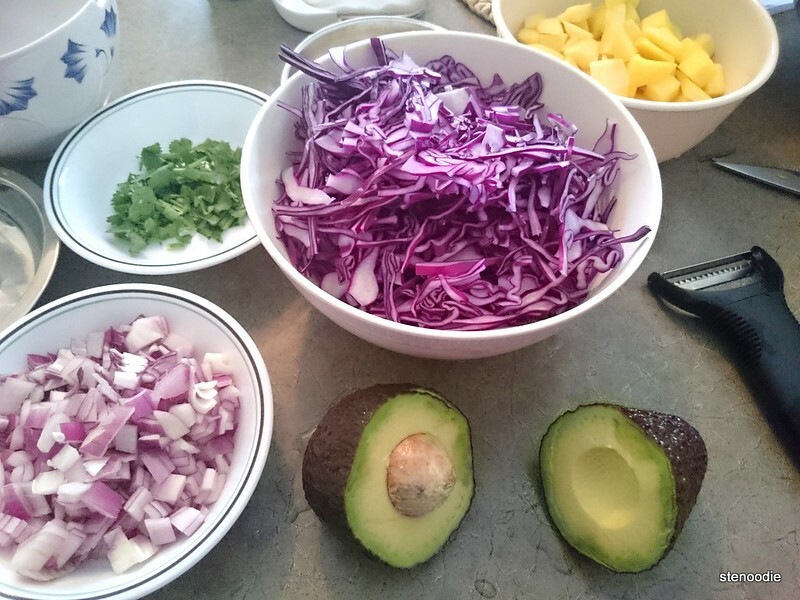 Make the avocado and purple cabbage slaw. 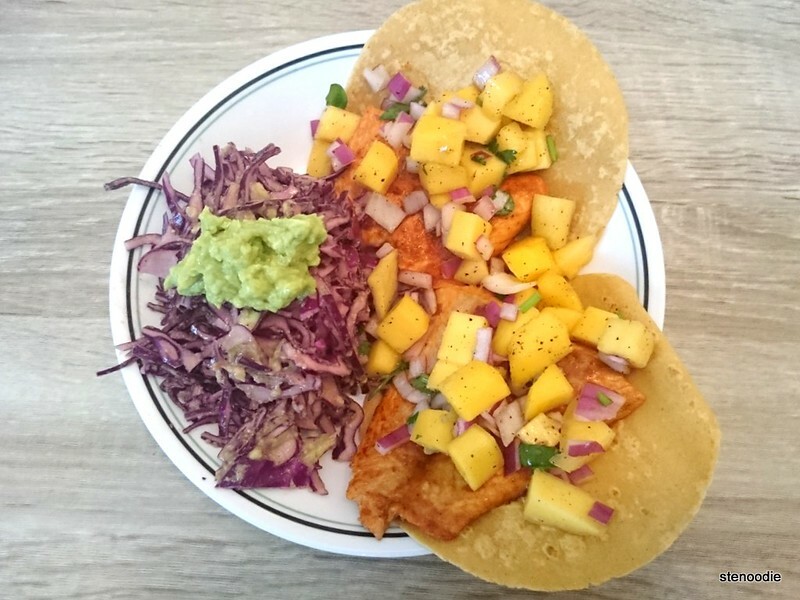 Warm up the pre-made corn tortillas. Cook the fish. Ta-da! Just plate and then eat. It was so simple! 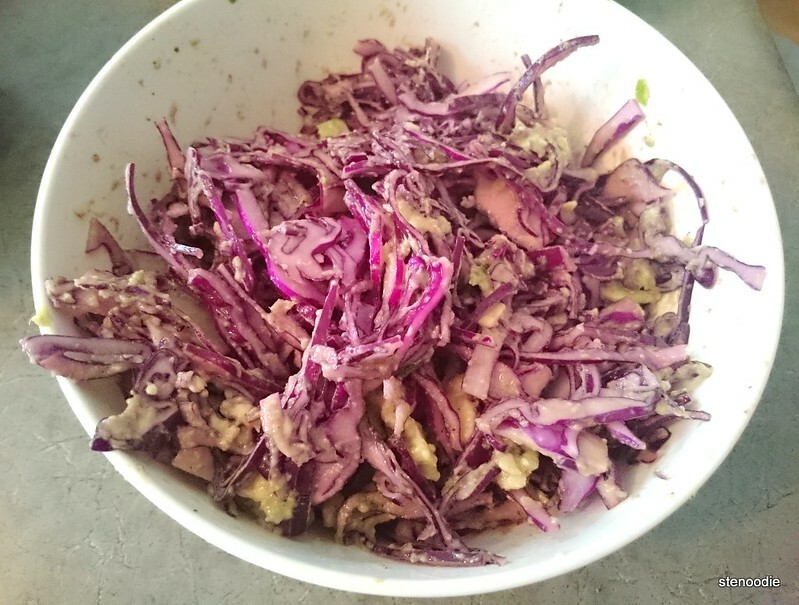 The avocado and purple cabbage slaw is done! 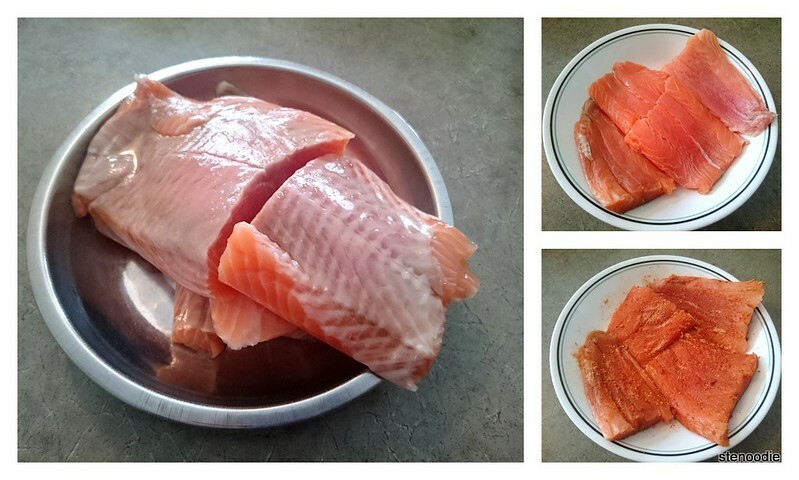 Wow, I was actually so impressed with the quality of the salmon here. 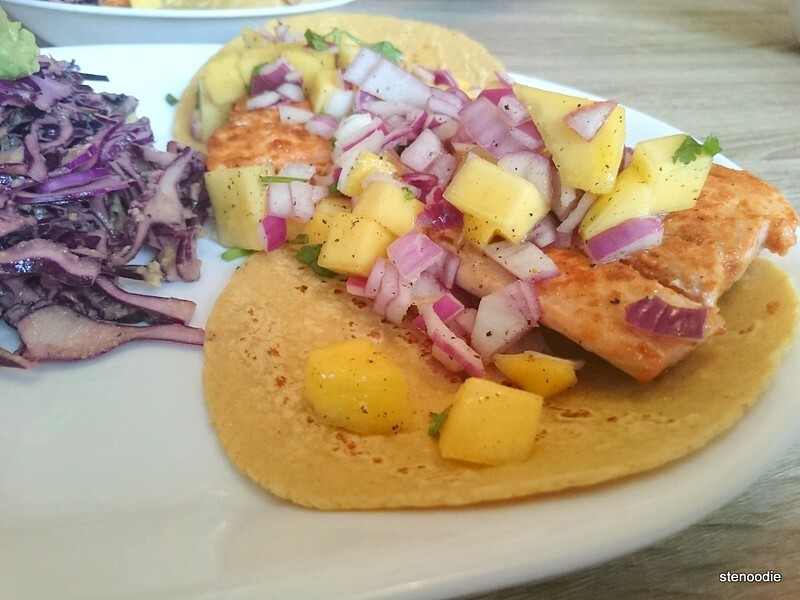 The salmon used here were salmon tails (to ensure an “ideal shape” for the tacos and because they are “longer and less dense” than any other part of the fillet, making it perfect to eat in a taco). 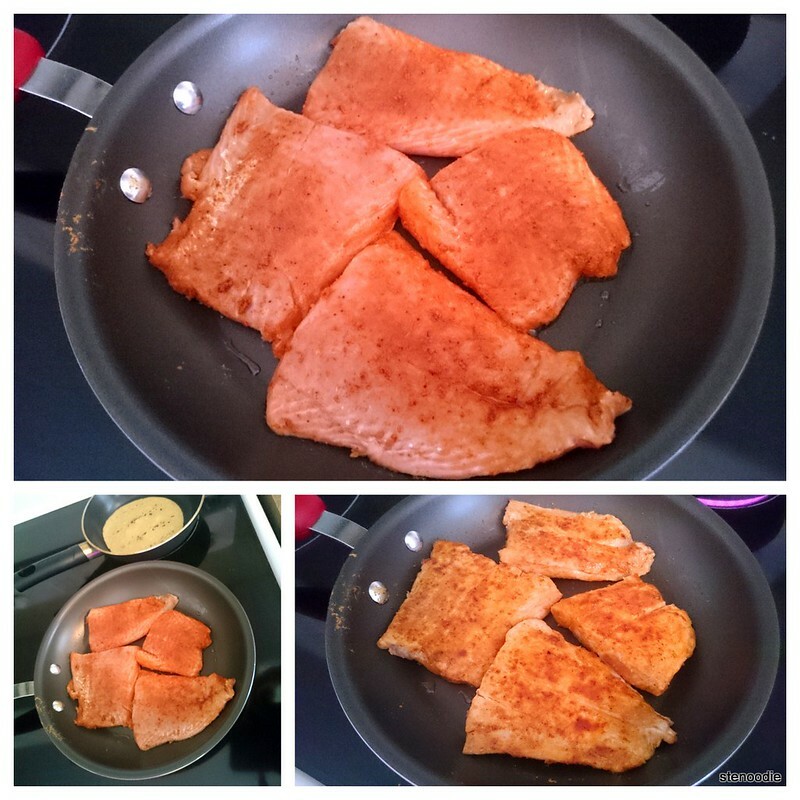 Cooking it for only 2 minutes on each side helped to ensure that the lightly seasoned salmon fillet was super tender and soft. 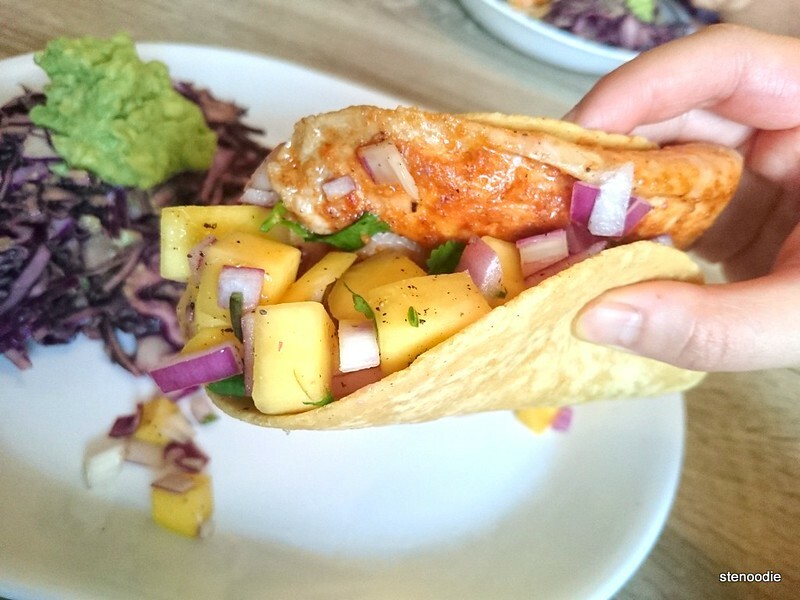 It was a delicious bite into the soft taco with gushes of sweet mango and crunchy red onions covered with a light dressing of lime juice, salt, and pepper. It was the perfect combination of flavours! 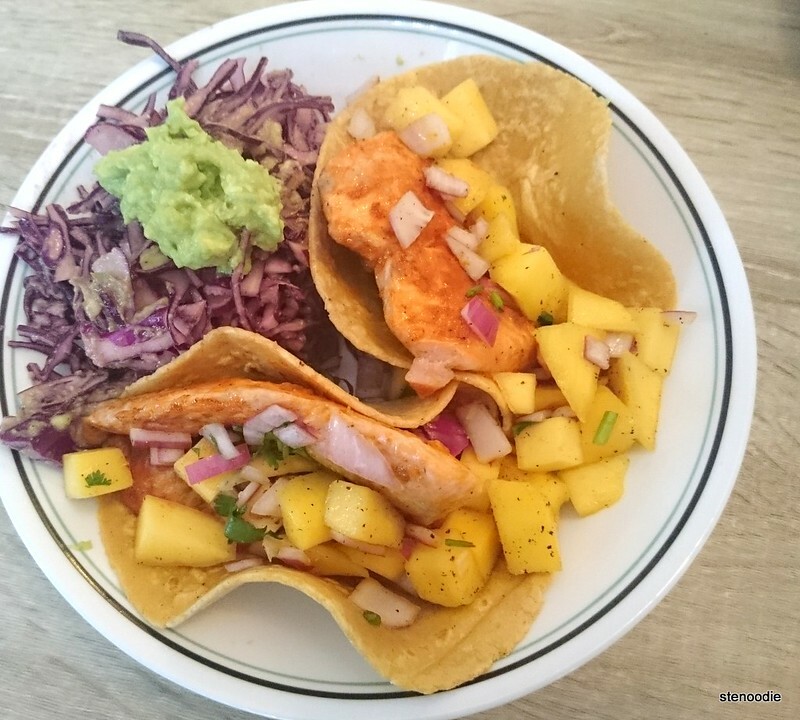 The corn tortilla (literally) wrapped it all up in flavour as well. 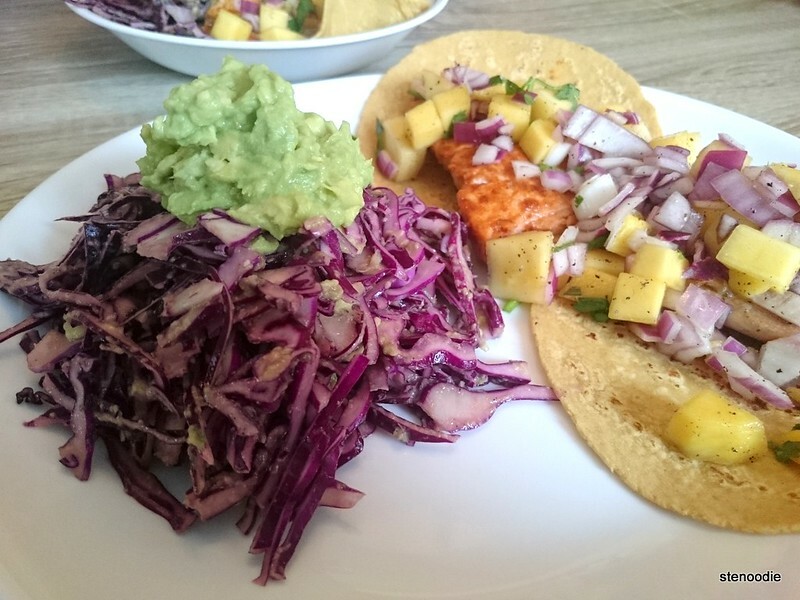 I thought that it was so creative to use avocado mash as a “dressing” for the purple cabbage slaw. 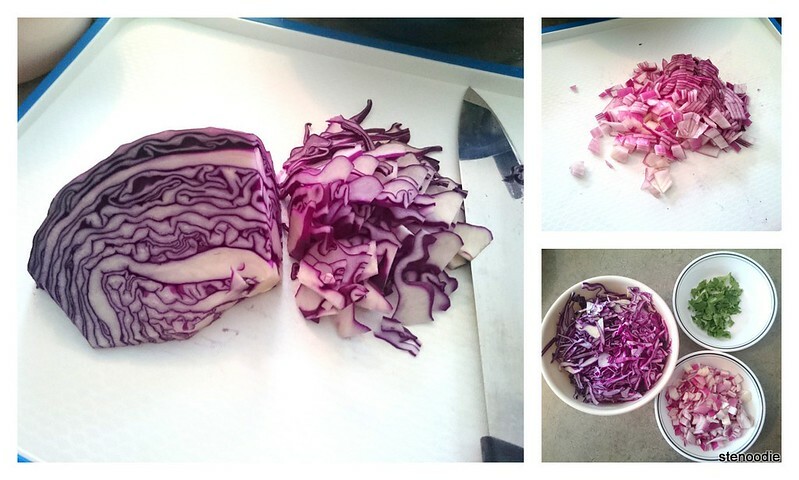 There was a lot of fiber in the purple cabbage slaw so I really had to make sure that I chewed down everything before I kept eating. 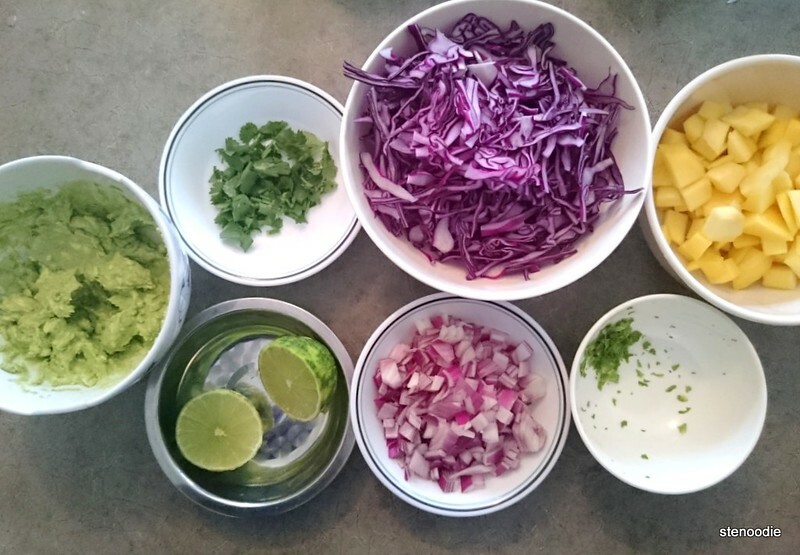 This was a really great healthy slaw! In fact, this entire plate was so healthy. 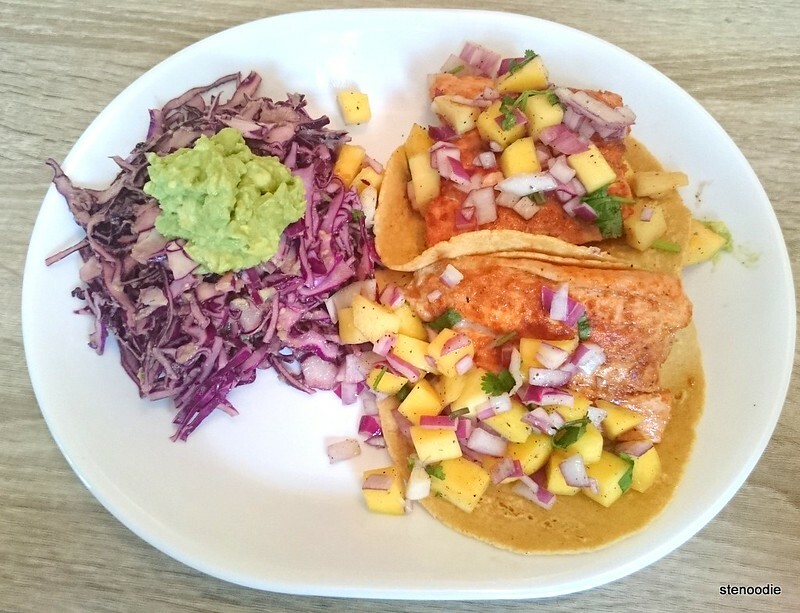 There was salmon, just a bit of starch from the tortillas, and the rest were all veggies and fruits. What a great meal this was! 😀 Thanks again, Chef’s Plate! 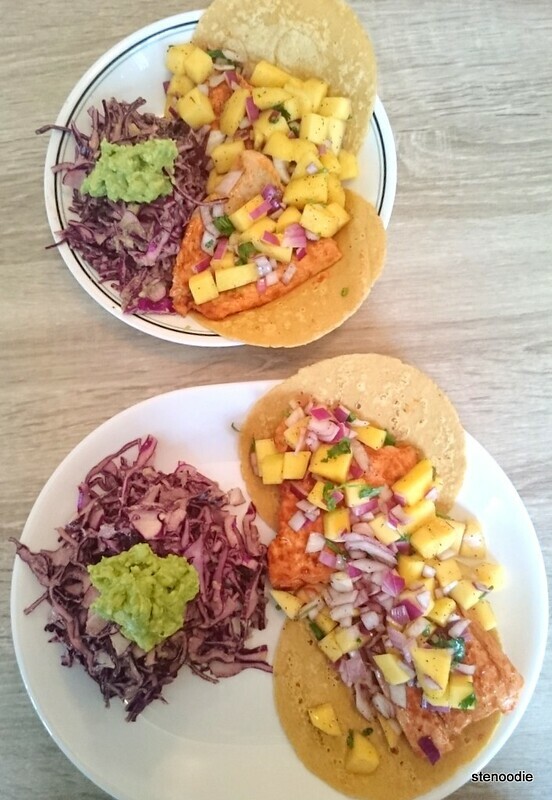 This entry was posted in Chef's Plate, cooking, Food and tagged #2mealsFromstenoodie, #3platesFromstenoodie, @ChefsPlateCA, Avocado and Purple Cabbage Slaw, cabbage slaw with avocado, Chef's Plate, complimentary, cooking, DIY, easy to make fish tacos, free Chefs Plate promo code, fresh, groceries, home cooking, home delivery, homemade, how to make salmon tacos at home, ingredients, locally sourced, Mango Salsa, promo code #stenoodie, recipe, referral code for chef's plate, Salmon Tacos with Mango Salsa and an Avocado and Purple Cabbage Slaw. Bookmark the permalink.